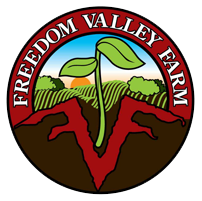 We at Freedom Valley Farm LLC, wish to provide you with fresh, local, seasonal food. You, the member, wish to receive a portion of our harvest. This Agreement outlines our shared commitments to that relationship. The Farm is well known locally for the quality and freshness of its products. We have taken hard earned cash and invested it in the Farm for a potential profit; committing our land, capital, labor, reputation, and honor. We act in good faith to provide excellent produce from the Plan’s harvest seasons, but farming by its nature has inherent benefits and risks. Weather, pests, and other events will impact production. You agree in joining with us that both benefits and risks are included in the Plan membership. The Farm will work to minimize risk, but cannot reimburse, refund, or otherwise compensate any portion of a season’s membership in the event of crop failures or low yields. Each member is entitled to a “share” of the Farm’s weekly harvest. A Full Share is intended to provide weekly produce for 2 adults and 2 children. Half Shares are intended for 1-2 people. The contents of a weekly share vary as the season progresses. We strive to provide a variety of high-quality produce every week but the mixture and amount of items offered depend on the success of our crops. Assuming average or better weather conditions we will deliver every week during the Plan season. In addition to the Plan, the Farm sells at farmers markets, to restaurants, and to others as opportunities arise. We balance priority of the Plan with our other markets. This allows us to select a consistently full and diverse share to our customers while avoiding over-delivering any one product. Splitting a Plan share among two or more individuals is the responsibility of those involved. In a split situation only one individual can register as a member, and that person is responsible for making full payment. Plan members can purchase any of our products available during the season at a 10% discount. This applies to anything aside from the Plan that may be for sale on our website and to items for sale at farmers markets. 1) Return the previous week’s box every week. 2) Pick up your share within the agreed timeframe. 3) Be respectful of the pickup site hosts’ property. 4) Follow other rules if posted at the site, such as for parking, use of certain entrances, boxes, etc. 5) You agree to release the Farm, it’s employees and owners, and any individuals associated with pickup sites from any responsibility or liability for injuries which you, or anyone accompanying you or in your stead, may incur as a result of being on or the site. You select one pickup location at the beginning of the season by registering online or by paper. If you need to switch mid-season, we ask for at least three days’ notice. If you cannot pick-up your share, you must arrange for someone else to pick it up for you. You are responsible for explaining the pick-up location and procedures to your substitute. We cannot guarantee that your share will be available if you miss your pickup (though we will try). Any shares not picked up may be donated to a recipient or organization chosen by us. Membership is a commitment to purchase and receive vegetables for the entire Plan season, or the remainder of the season if you join after the first delivery date. A season’s beginning and ending dates, the number of weekly deliveries, and pickup locations are those on the Farm’s website at the time payment is made. Members have direct contact with us via email, by telephone and in person at farmers markets and pickup locations. Just before a season starts we begin sending weekly e-mail reminders with links to a short message from the Farm, and to a list of produce that will be in the next weekly delivery. Additional information is occasionally provided on the Farm’s website. Your contact information is valuable because it helps us to stay in touch and to provide you with the best possible experience. The Farm will never share your information with anyone outside of our organization. The Farm offers a variety of payment methods, including by credit/debit card and by check. You become a member of the Plan, subject to our approval, when we receive payment in full at registration. Payment confirms your intent to be a member of the Plan and forms an agreement between you and the Farm. Although unlikely, we may change parts of this Agreement related to production and distribution from time to time. You understand we will contact you in advance of any changes to this Agreement. Your payment affirms that you have read and understand this Agreement, the “Season Details” section of the Farm’s website, and the policies thereon. “Season Details” are also included beneath the signature line on the paper copy of this Agreement. Thank you for your membership and for your commitment to our community, to eating seasonally, and for supporting local agriculture. n";n=LP_measureText(a,n,null,"font-size: 14px;font-family: Helvetica,Arial,sans-serif;font-weight:bold;"); n.width+20+l>j&&(j=n.width+20+l)}}g_do_icon_number_hint&&(g_icon_numbers.sites=e,g_icon_numbers.formfills=f);if(do_popup_actions)0=e&&0>=f)return null;g+="